KCC’s second annual Bruin Boo! Halloween and trick-or-treating event for kids and families will run from 6:30 to 8 p.m. Thursday, Oct. 26, on the College’s North Avenue campus in Battle Creek. During this time, the central areas of campus – including the outdoor areas surrounding the reflecting pools, the Whitmore and Severin Buildings, the central walkway, the Hub, the Student Center and the Binda Lobby – will be EXTREMELY busy with foot traffic from community members participating in the event. It is recommended that students make plans for possible delays getting to and from class while on campus at this time. Students with evening classes may want to plan on parking in the lots on the south side of campus, near the Lane-Thomas and Davidson buildings, to avoid event traffic and congestion. The Circle Drive at the main entrance to campus will close at 3 p.m. for the event. Cars that are already parked there at this time may leave, but no cars will be able to park in the Circle Drive after 3 p.m. Additionally, the Bruin Bistro will close at 6:30 p.m. Thursday – a half hour earlier than usual – for the event. Also: Feel free to attend the event and bring your families! The event is free and open to the public. Giveaways are meant for the kids, but BC Vision/Bronson Battle Creek will have a tent up on the Circle Drive with some healthy food options for all, and it’s a fun event just to take in for the holiday. Please send any questions or concerns to KCC’s Simon Thalmann at thalmanns@kellogg.edu. For questions about specific classes running Thursday night, please contact your instructor. Click here for more information about Bruin Boo! Click here to view KCC’s Bruin Boo! event post on Facebook. 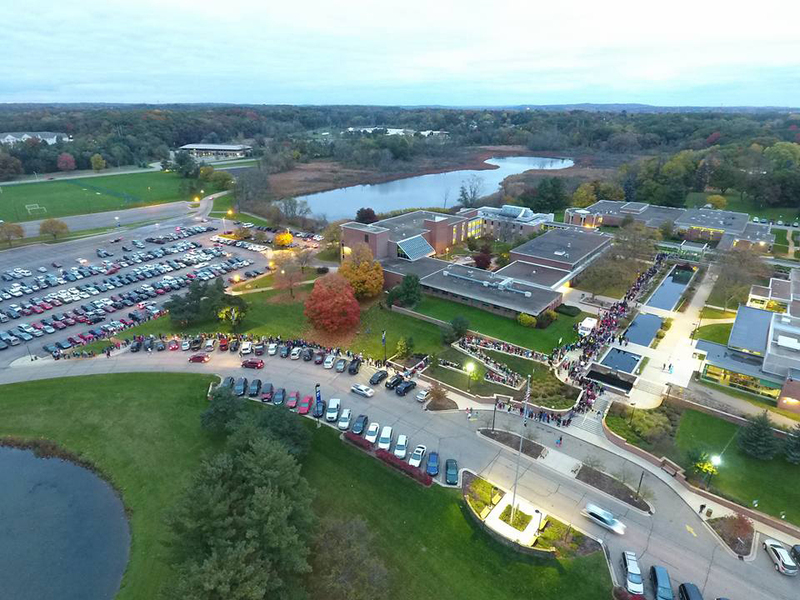 Pictured above is the line waiting to get into last year’s inaugural Bruin Boo! event on campus, photographed by community member David Espinosa.